ConocoPhillips strongly believes in neighbors helping neighbors. We provide grant dollars to various youth, education, civic and social service nonprofit groups in Alaska. If a ConocoPhillips employee volunteers for your organization, be sure to remind him or her to apply for a company-sponsored Volunteer Grant! ConocoPhillips donates millions of dollars to community organizations annually. 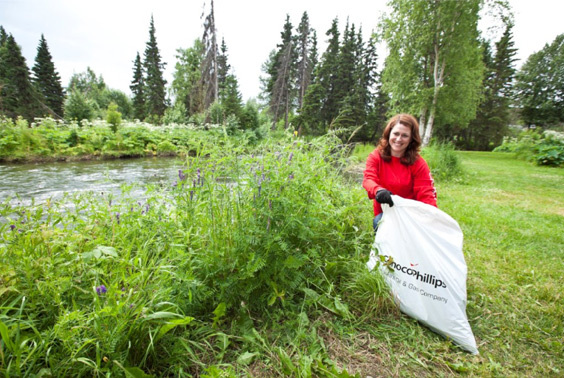 Since 2000, ConocoPhillips has donated more than $106 million to Alaska-based nonprofit programs and projects, including more than $35 million to the University of Alaska. In addition, the company provided $5 million in funding to the Cancer Center at Providence Alaska Medical Center to provide Alaskans quality care here at home. Historically, an average of approximately 50 percent of our philanthropic dollars goes to programs dedicated to education and youth. Approximately one quarter goes to social services organizations, and the remainder goes to support civic and arts groups as well as environment and industrial safety programs. The company also provides contributions to organizations supported by our employees through volunteerism. ConocoPhillips has a number of grants available to nonprofit groups and community organizations. If you are a first time applicant, please click on apply for a charitable contribution. If you have previously applied for grants with ConocoPhillips in Alaska, click returning applicants. The ConocoPhillips Anchorage Tower Atrium has hosted many fundraising events for non-profit organizations such as Dollars for Dogs, Catholic Social Services, Alaska Federation of Natives, the Alaska Museum of Natural History and Alaska Public Telecommunications, Inc., to name a few. By being able to host fundraisers with a minimum of overhead, these organizations were able to reduce costs and increase the effectiveness of the funds received for their programs. We are pleased to be able to donate the use of our Anchorage Tower Atrium for events for groups that qualify. To find out if your group is eligible or check potential dates, contact our External Affairs staff at 907-263-4868.